Enteral Feeding Devices Market size was valued at USD 2.3 billion in 2017 and is expected to witness 6.1% CAGR from 2018 to 2024. 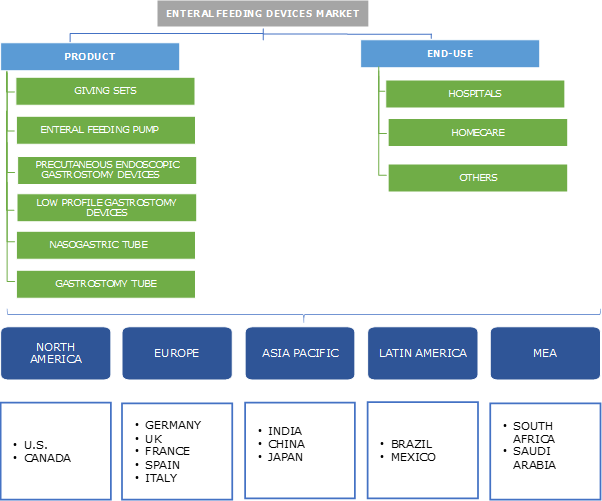 Enteral feeding devices market should witness growth in forthcoming years due to rising prevalence of chronic infections and diseases especially in Europe and also in developing countries such as India. Chronic diseases such as cancer and diabetes are one of the leading causes of mortality in Europe, more than 60% of the people in age group of 60 and above have at least one chronic condition. For instance, as reported by WHO, around 60 million people in the European region are suffering from diabetes that will positively impact on enteral feeding devices industry growth. Growing adoption of technologically innovative devices in the North America will augment penetration rate of enteral feeding pumps. Key industry players will focus their efforts on introducing technologically advanced devices, thereby will escalate enteral feeding devices industry growth over the forecast timeframe. Technological advancements in enteral feeding devices include texture modifications in products to suit individual patient requirements. Furthermore, development of portable and disposable pumps should impel the industry growth. The introduction of portable and affordable devices is expected to upsurge adoption rate in point of care healthcare facilities and small peripheral laboratories. Thereby, augmenting enteral feeding devices market growth in the upcoming years. 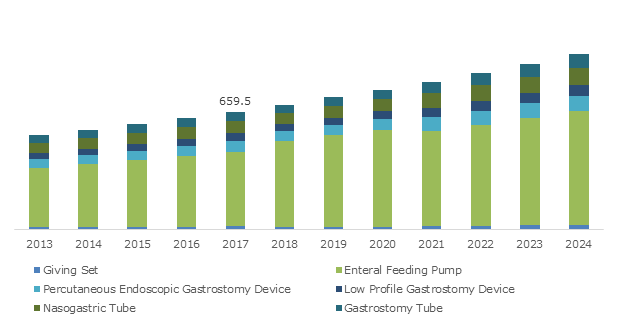 Enteral feeding devices market will be hampered due to complications associated with small bore connectors. For instance, an enteral feeding system may get connected to tracheostomy tube and such errors may result in patient injury and death restraining industry growth in the near future. Enteral feeding pump segment accounted to revenue share of 61.9% in 2017 and should grow enormously over the estimated timeframe. Enteral feeding pump segment will witness significant growth over the coming years due to its increased usage in hospital and home care settings. Enteral feeding pump enables consistent and accurate delivery of enteral nutrition with reduced errors thereby, should augment the segmental growth. Percutaneous endoscopic gastrostomy device segment will grow at 6.5% over the forecast timeframe and segmental growth can be attributed to the rising adoption of percutaneous endoscopic gastrostomy devices by geriatric population suffering from chronic diseases requiring long term enteral nutrition thereby will drive segmental growth over the forecast timeframe. Hospitals segment was valued at USD 1.5 billion in 2017 and is expected to grow over the estimated timeframe as a result of growing patient population suffering from chronic conditions such as cancer along with increasing number of baby boomers. Elderly people generally suffer from digestive and ingestion problem hence essential nutrients are supplied through enteral route in such cases, influencing the segmental growth positively over the forecast timeframe. Homecare segment had a momentous revenue share of 20.4% in 2017 and should have high growth trends. Segmental growth can be attributed to increasing preference for enteral feeding tubes by geriatric population as point-of-care device at home due to ease and convenience offered by enteral feeding devices. Moreover, increasing number of children suffering from malnourishment and metabolic disorders requiring energy source thereby, should propel the business growth. U.S. enteral feeding devices market should grow at 5.8% over the forecast timeframe and the high growth can be attributed to increase in per capita income of the country. In addition to the aforementioned factors, growing aging population, increasing prevalence of diseases such as cancer, cardiovascular, diabetes, dementia should foster business growth. Augmented number of premature births in the U.S. will fuel enteral feeding devices industry growth. Japan enteral feeding devices industry accounted for 43.8% revenue share in 2017. High revenue share of enteral feeding devices market in Japan can be attributed to the nutritional problems that are associated with the rapid rise in the geriatric population. Also, changing lifestyle and increasing disorders related to it will impact the business growth positively. Some of the major industry players operating in this industry include ALCOR Scientific, Abbott Nutrition, Amsino International, Applied Medical Technologies, Baxter International, B. Braun Melsungen, Becton Dickinson, Boston Scientific, Cardinal Health, Cook Medical, ConMed, Danone, Degania Silicone, Fresenius Kabi, Halyard Health, Moog, Nestle, and Vygon. These prominent industry players have implemented certain strategic initiatives such as new product launch that will improve their position in the market. For instance, in May 2017, Halyard healthcare made a strategic decision of adding a new drainage system to the extensive portfolio of enteral feeding system. This strategy will aid revenue generation for the company. Enteral feeding devices industry has evolved extensively in the last 3,500 years. During 1480, Greeks and Egyptians infused nutrient solutions to treat bowel disorders. Currently, the enteral feeding devices industry is consolidated in nature with few dominant players focused on adding technological advancements in the devices for improving its efficiency and performance. Also, the industry is in developing stage that gives key industry manufacturers to develop in terms of introducing innovations in the devices.